The Traffic Engineering and Transport Planning Agency (TEPA) will complete the Metro Bus System (MBS) Project by 20th January, 2013. The agency also planned to inaugurate the project soon after its completion. Sources reveal that the authority and other contractors were scheduled to complete the project by 31st January, 2013 but Chief Minister Shahbaz Sharif directed the officials to complete the project by 20th Jan. Upon direction, the work picked up pace. According to sources, the entire 27 kilometre dedicated bus pathway is complete except three small portions from Niazi Chowk to Shahdara, Kalma Chowk and Model Town Underpass. It is also expected that work on two small portions of Kalma Chowk and Model Town Underpass will be completed by 9th January. Keeping in view the current construction pace, the MBS would be ready for bus operation by 20th January. The officials said that the dedicated bus pathway is currently planned to ply buses at the moment but it can be used for running a train as well. Another TEPA official said that currently 100 percent work has been completed on five bus stations out of total 27 and the remaining 22 bus stations will also be completed by 15th January as almost 80 to 90 percent of work related to preparation of platforms, lighting, automated announcements, elevators, ticketing and others had been completed already. He also said that TEPA officials would complete the Model Town Underpass project by 9th January and the CM would open it for traffic on 10th January. Kalma Chowk will also be opened on 9th January for traffic as per schedule. 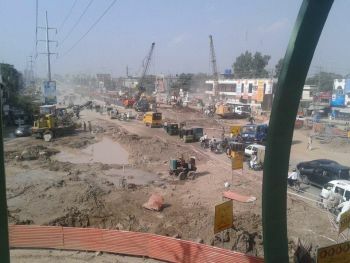 However, work on Kalma Chowk underpass will continue till completion deadline i.e. 31st January. At the same time, various concerned departments have also completed feasibility studies for launching the MBS on Multan Road and Azadi Chowk to Railway Station, besides connecting it with Ring Road.